Oh yeah….you read that right. 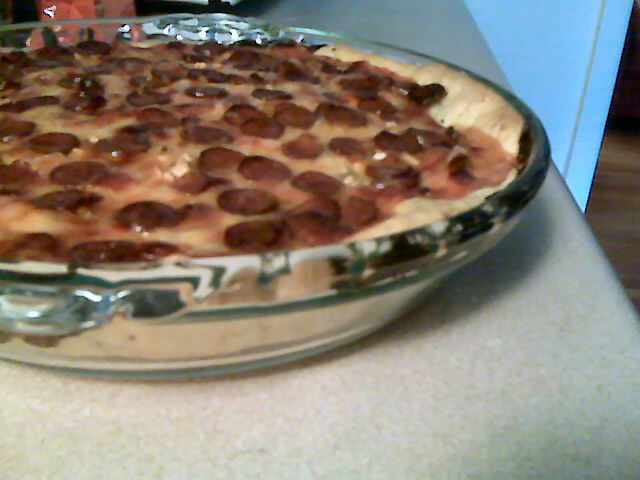 A deep dish pizza pie. Have your own decadent pizza party without a lot of that guilt and grease. I started this blog with the idea that you can eat all those tasty and sinful foods we all love but change them to suit a healthier diet. This is another one of those triumphs. It made my husband all teary eyed to see this pile of decadence cross his plate. I was tempted to name it pizza the hut but that’s just a totally different story hehe. You can make the dough using whole wheat flour but I ended up using unbleached white simply because it was on hand. If you use a breadmachine add ingredients according to the directions on yours and use the dough cycle. If you are making by hand. Combine the ingredients and proof twice. Knead the dough. Separate the dough into two balls. Freeze one for a future pizza. Roll out the other and press it into a sprayed pie pan. Bake at 400F for 40 minutes. Allow to sit for 5 minutes, slice into 8 and serve. This makes eight slices. Each slice of the dough alone is 146 calories, 4.2 grams of fat, and 1.25 grams of fiber. Now here is where you have to be smart about your toppings. I’m a simple girl when it comes to my pizza. I love a good old fashion pepperoni pizza. My pizza with the toppings came to 159 calories, 5 grams of fat, and 1.75 grams of fiber per slice. Here is how I did it. My toppings quite simply were: 1/2 cup of skim milk mozzarella, 6 tbl grated parmesan cheese, 1/2 cup ragu original ground beef tomato sauce, 1 turkey bite pepperoni stick (sliced), and 2 cloves of garlic minced. So very tasty. Of course your pizza taste will vary but a deep dish pizza is definitely not out of reach as long as you use the right toppings. This entry was posted in Comfort Foods, Dinner and tagged Bread, pie. Bookmark the permalink.